On December 28 the Church celebrates the Feast of the Holy Innocents, Martyrs. 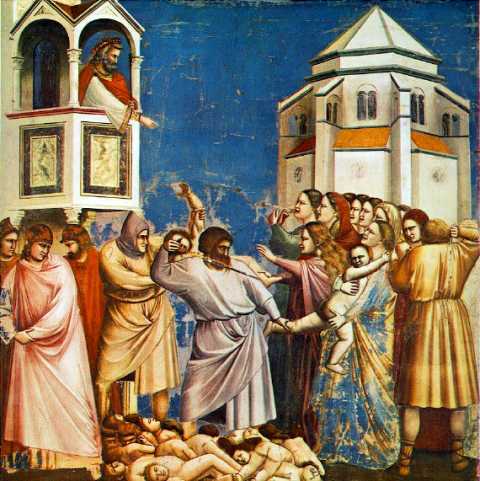 The Holy Innocents, as depicted in this painting by Giotto di Bondone, were the young male infants murdered in Bethlehem by the decree of King Herod. You can read the account of this massacre in Matthew 2:13-18. If you recall, King Herod had inquired from the Magi where the Messiah was to be born. Herod sent the Magi to search for the infant, and then to let him know where the child was at. Herod really wanted to kill the infant Jesus because Herod was jealous, but he had told the Magi he wanted to pay the infant homage. After the Magi had followed the star and found Jesus, an angel warned them to take a different route home to avoid King Herod. An angel also came to Joseph in a dream and warned Joseph of the danger to the infant Jesus. So Joseph took Mary and Jesus and fled to Egypt, where they remained until the death of Herod. 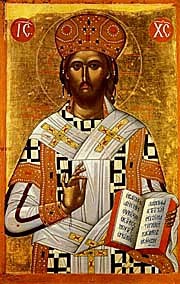 King Herod became so angry when he found out the Magi had tricked him, that he ordered the death of all the infant boys under the age of two years in and around Bethlehem. These male children murdered by Herod's decree are called the Holy Innocents. Perhaps you are familiar with a Christmas carol called "The Coventry Carol." This carol originates from the medieval mystery plays in Coventry, England, one of which recounts the Massacre of the Holy Innocents. In this carol, a mother is lamenting her young male child who has been sentenced to death by King Herod's decree. Learn more about this carol and the Coventry Plays here. Below you can also listen to Dale Warland's arrangement of "Coventry Carol" performed by the Roanoke College Choir under the direction of Jeffrey Sandborg. It is very sad during these days of Christmas rejoicing to realize that violence, even violence against innocent children, has been, and continues to be, a part of our human history. Pray today in a special way for all victims of violence, especially innocent victims such as children. Perhaps there is a non-profit organization in your area that provides outreach to victims of violence. Research how you might work to help end such violence. And begin by practicing peace and non-violence with all those you encounter. Thousands of children continue to die today by violence, but also by other causes such as famine and drought and other natural disasters. Find out from Catholic Relief Services how you can help. They also have excellent educational resources to help children and youth understand more about these disasters and how we can all come together as a world community to support those in need and help ease and end the suffering and death. The account of the Massacre of the Innocents also evokes another social justice issue, that of immigration. The Holy Family had to flee Bethlehem for Egypt to escape the violence. Immigration remains a major issue in our day. Visit the USCCB "Justice for Immigrants" web site here. And learn more about the USCCB's Migration and Refugee Services here. “St. Joseph was an immigrant. By necessity he had to abandon his home, taking Mary and the child Jesus to a foreign land. St. Joseph throughout his many trials trusted in God’s providence and faithfully provided for his family. The plight of Joseph and the Holy Family in the gospel according to Matthew is mirrored repeatedly in the lives of many immigrants and refugees who have come to the United States.” – Bishop Kevin Vann’s (Bishop of the Catholic Diocese of Orange) Meeting with Representative John Campbell of Irvine.